Jumbie's Watch: Do you know about 3D printing? Do you know about 3D printing? If you do a quick inventory of what you own, you will find that most of it is mass produced. This is a result of the industrial revolution, during which we gave up the individually crafted object in return for factories, and in the process got extremely rich. The price was the acceptance of uniformity in every aspect of our lives: our pens, our clothes, our cars, even our homes are all mass produced. It is a dominant influence in our lives, and it shapes global capitalism. But now there is a technology coming out of university science labs that could change all this and set in motion a second industrial revolution that may reverse the whole process. The technology is called a 3D printer. What it does is this: it takes a design from your computer and makes it into a physical object. In other words, you press "print" and out comes a thing; this can be a functioning pen, a pair of glasses, or a hip replacement. This is not science fiction: I have a 3D printer in my lab and it works. At the moment the technology is in its early stages, but already hospitals are using it to make tailor-made implants for patients. Think what might happen if we perfect this technology. Why buy a phone, when you can design and print your own? Why buy a ring when you can express exactly how you feel by making one for your lover, or new cutlery for your mother? The possibilities are literally endless. But it has political and economic implications too. As soon as our desire for material wealth is no longer linked to mass production, factories may become redundant, and shops too. This technology is currently at the state that computers were in the 1980s. Will science and engineering deliver another industrial revolution by perfecting the 3D printer as it did the computer? 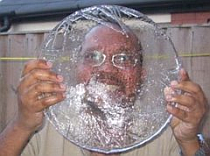 Mark Miodownik is a physicist at King's College London. Taken from: Ten questions science must answer. I admit, I didn’t know this was possible and even while reading about it, I keep thinking it is another, more advanced way of creating a prototype – similar to sculpting from a 3D holographic image. It is not quite what entered my mind.